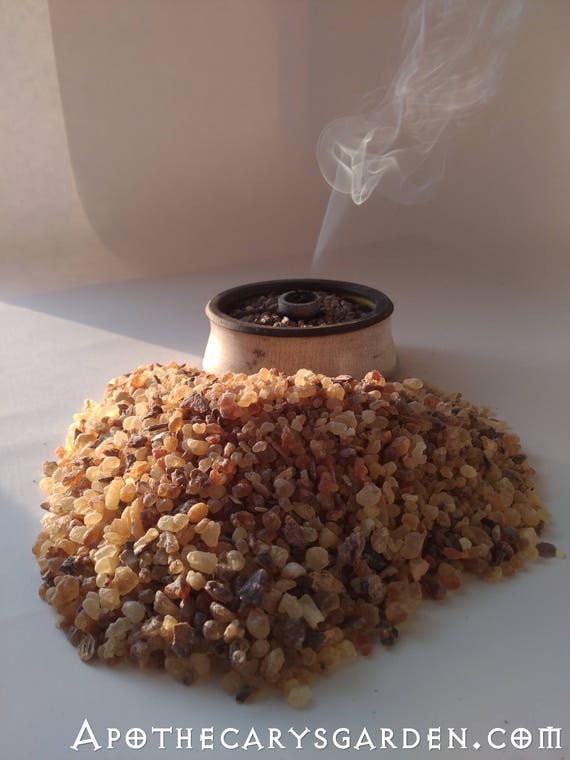 There is increasing information online about the healing properties of the different types of Frankincense. Notably, the Boswellic acid family including AKBA which make up a large proportion of the resin in these oleo-gum-resins. In general, they all share anti-bacterial and anti-inflammatory properties which make them ideal for many external and internal applications. Phytochemicals in Frankincense have been proven useful for arthritis, rheumatism, cancer, ulcers, colitis, brain injuries, depression, and much more. They are especially useful in cremes, oils and salves to help rejuvenate the skin, increase elasticity, reduce wrinkles and signs of aging. Many of these healing compounds can be absorbed through the skin and are able to cross the blood-brain barrier. The whole oleo-resin provides a broader spectrum of phytochemicals, and from a holistic and synergistic point of view more effective than the isolated essential oils. 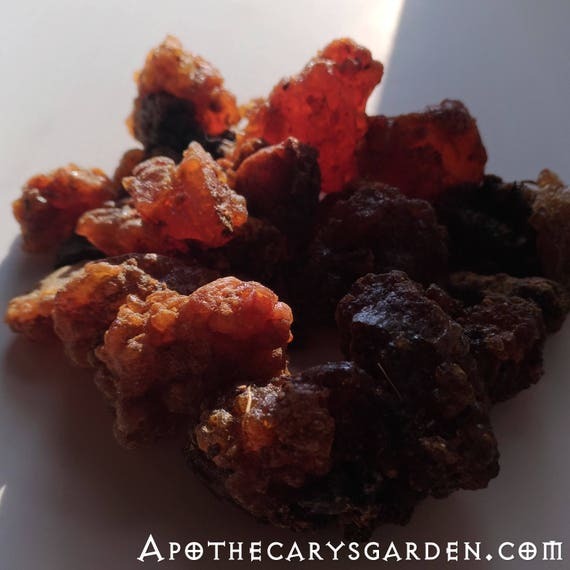 There is not much information on processing oleo-resins online, nor is there an abundance of research available on the many types of Frankincense compared to other medicinal Herbs. This is slowly changing as the interest in therapeutic properties of oleo-resins increases. A great number of the tree oleo-resins in our little garden world hold therapeutic properties that we have used for thousands of years, long before distilled essential oils were commonly available. Mastic, Spruce, Pine, Fir, Opoponax, Myrrh, Frankincense and many others have been highly valued for their healing properties. We are only beginning to appreciate the degree of their healing potential. Finely ground Frankincense oleo-resins for extraction. From left-Boswellia Papyrifera, Boswellia Neglecta, Boswellia Rivae. Oleo-resins are usually extracted via volatile solvents. The most common are ethanol and petroleum distillates. Once the oleo-resin is separated from any water-soluble gum and foreign material, the solvent is evaporated and the remaining sticky mass utilized. Another approach is to use non-volatile solvents such as vegetable oils and animal fats to extract the therapeutic compounds from oleoresins. They are much gentler than many volatile solvents, do not harm the environment in their production, use and disposal and pose no threat to our health in topical or internal applications. They are easy to make, purchase and use, they break down and decompose without adding toxins to the environment, and are safe and easy enough to use in any kitchen and home. Using non-volatile solvents creates new opportunities for self care and making our own medicine. 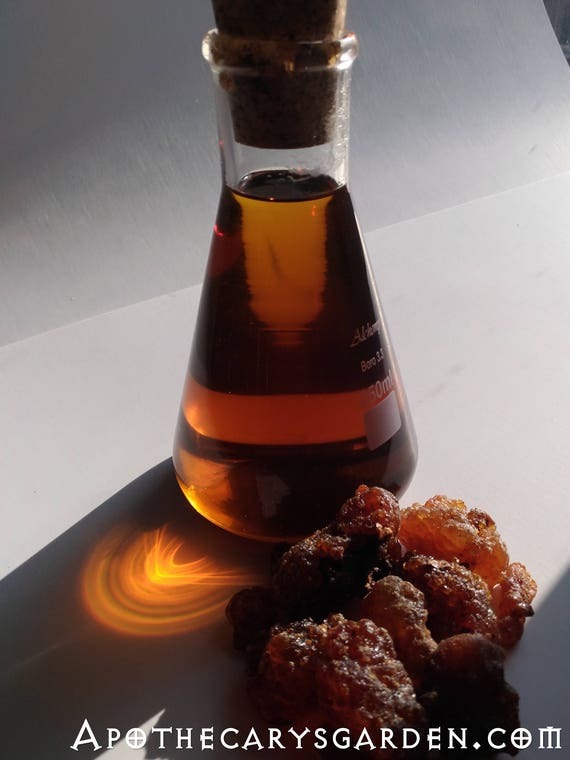 Frankincense oleo-resin extracted from Boswellia Neglecta with Olive oil. Originally made as a chest rub for respitory releif. After using it for a year and collecting feedback from other users, I am forced to change its description and application. Rubbed on the chest, it is a surprisingly effective treatment for anxiety, panic attacks and tightness of the chest. It quickly removes the sharp physical pangs of anxiety, lifts and lightens the chest, eases and deepens breathing even during an Asthma attack and brings about a deep feeling of calm. I keep wondering if I am projecting here, but reports from others who use it confirm my description. Pretty amazing. Pine, Spruce and Fir saps still have the lead for coughs, colds and releif of respiratory congestion. The use of vegetable oils as solvents and carriers for oleo-resins makes these products eminently suitable for external use as oils, liniments, cremes and salves. It can also provide an option for a more readily digestible and easily assimilated product for internal use. This type of extraction requires no special laboratory chemicals or equipment, and can be performed in any kitchen or field with a simple water bath, mortar and pestle or electric coffee grinder. Oh, and a pillow case.. I have found 2 vegetable oils work particularly well with most oleo-resins. They are Jojoba oil and Olive oil. I stick to cold pressed extra virgin Olive oil even though it often has a more bitter flavour and scent. Jojoba works well if the finished product is for external application only. Jojoba is really a wax and not a true oil. It keeps extremely well on its own, though if making an emulsion type crème, a broad spectrum preservative is needed due to the presence of water. Oleoresins are natural preservatives. Hence their extensive use historically for embalming and preserving corpses…. However, I can find no studies that show exactly what percent of oleoresins will preserve vegetable oils or aqueous solutions, and for how long. So for the time being some type of preservative is called for. Olive oil is an ideal carrier and solvent. It has been used for centuries for its therapeutic effects on skin, hair and GI tract. If you plan to keep any vegetable oil or animal fat product longer than 6 months unrefrigerated, Vitamin E will greatly delay rancidity and extend its shelf life. Any vegetable type oil, (not mineral-based), or animal fat such as tallow or lard will work as a solvent for most oleoresins.This includes Coconut oil, nut oils such as Almond, Hazelnut and Macadamia and any of the exotics such as Argan oil, Baobab oil etc. Choose an oil based on your needs and preferences. Some oils keep longer than others though Vitamin E will extend the life of most oils. If you are using any type of Frankincense, Mastic, Myrrh, Elemi or other hard brittle oleo-resins, grind them to a fine powder first. (See the post on how to grind Frankincense & Myrrh. ). The finer you grind them, the more readily and quickly they will dissolve in the oil. If using fresh pliable oleo-resins such as Spruce, Pine or Fir, the soft saps can be used as they are. In a water bath heat up 1 part oleo-resins by weight to 2-3 parts oil in a glass or mason jar. (See A Solid moustache wax recipe) for complete directions on making and using a water bath at home. When the bath reaches temperature and starts boiling, stir to break up any lumps and let sit in a simmering bath with occasional stirring for up to 3 hours. Remove from the bath and filter when no more oleo-resin can be dissolved. Frankincense Papyrifera ground in a steel mortar in preparation for extraction. In the case of Boswellia Frereana, Maydi), the oleoresin dissolves into the oils within minutes of the bath reaching the boiling point. (It has little to no water-soluble gum). As soon as you have a hot homogenous liquid you can proceed directly to filtering. Filter the hot liquid carefully through a fine metal mesh coffee filter, the corner of a well washed and thoroughly rinsed and dried pillowcase, or through a good piece of cotton cloth similar in weave to a bed sheet. Place your filtering material in a funnel over a clear glass vessel or jar. (so later you can gauge when most of the sediment has fallen). Add the hot liquid extract. If using a cloth filter, twist the excess cloth on top to form a sachet, and press out the liquid from this bag with the back of a spoon. If using a metal mesh filter, running the back or side of the spoon against the mesh will keep the liquid flowing and the mesh open. Working with the extraction while it is still hot keeps it mobile, liquid and more easily filtered. It will thicken a bit when cool. Compost the residue or return it to the earth. Wait till all sediment falls to the bottom of the vessel. This could take a day or so. Pour or siphon off the clear liquid, leaving the sediment. You can return this or use it for external applications. If you plan to keep your extract around for a while, add 400 IU of Vitamin E to each 250 ml. or cup of extract. And it is ready to use. For internal use I suggest starting with 1/2 teaspoon of extract with food. See how your body feels about it. This is uncharted territory and you are ultimately in charge of your own health. We don’t know how much is too much. However compared to ingesting pure essential oils as some do, this method is relatively easy on the body and I believe likely more effective. For external use, apply to face, joints etc as often as desired. Again, listen to your body…. I am not an expert in cosmetics formulation. There is an abundance of great recipes online written by people with much greater knowledge of this art than I. I suggest you find one with detailed instructions for making an oil/water creme that appeals to you, and replace the oil portion in any of these recipes with your oleoresin extract to make a healing creme. The guidelines below are simply that, loose guidelines based around a recipe that works for me at the moment. Set up a fresh water bath with one jar for oil and a large jar for distilled water. Put the filtered and sedimented extract back in a jar in the water bath. Add distilled water in the second jar in a quantity that makes up 75% to 80% of the total weight of your finished creme. More water means a slightly thinner lotion or creme. If you are not using delicate oils, heat the water bath till boiling till both jars and the bath have reached the same temperature-If you are using oils that won’t tolerate high temperature then follow the instructions that come with the oil and bring both vessels in the water bath to the appropriate and same temperature. Calculate the total of all the oil soluble components you will have in your product, carrier oil, essential oils, waxes and oil based preservative if you are going to use one. Add 25% of the weight of the oil based portion of your product in emulsifying wax. Blend the wax in the oil completely. Remove from the bath and add the water slowly to your oil/wax mixture in a large enough bowl or jar to hold both materials comfortably. Stir or blend the oil-wax mixture for a couple of minutes and let sit. Every 15 minutes or so, repeat the blending till the mixture is room temperature and has started to thicken. This cooldown period is the time to add your essential oils and any other products that are heat sensitive. the weight of essential oils is added to the overall weight of the oil when you calculate how much wax to add. When room temperature and of the right consistency pour into clean, sterile containers. If you have not added a preservative then keep refrigerated. For long-term unrefrigerated use, a preservative is a must since you have added water to the formula. Bacteria and moulds are “suitcase in hand”, just waiting to move in. Liquid Germal Plus works well as a broad spectrum preservative and seems relatively benign. Add during the “Cooldown” stage and follow the directions that come with the product. It is considered one of your oil soluble ingredients and should be added to your calculation of how much wax needs to be added to your formula. Of course you can improvise with the formula to your heart’s desire. Depending on the purpose of your creme and your personal preferences, there are many waxes, oils, colourants and essential oils you can fine tune your product with. These are just the basics. I expect you to explore, be creative and have fun with it. For an excellent an excellent website dedicated to all facets of lotion and creme making, recipes, instructions, and tutorials, please visit Makingskincare.com. I am told regularly by concerned friends that I should not share secrets, methods and successful recipes online. I disagree. I believe we are at a stage in our evolution as a global society that all information needs to be shared freely and openly. The internet is our collective brain and even our collective consciousness. We all draw from it, and contribute to it one way or another. The time for hiding things, for secrets and shadows in the world is past. We need to share whatever we have. If we all shared freely and none of us hoarded any resources, there would be more than enough of everything to go around. There would be no lack in the world, no poverty, and likely no war. If we all actively sought opportunities to share, the transformation would be immediate. I also believe whatever we put out there always comes back to us in whatever form we need. So. Have fun, be responsible for your health and wellbeing, and share what you have. And always, always keep clear notes! A wonderful rejuvenative skin creme Simply made from the whole oleo-resin of Maydi-Frankincense Frereana extracted with Jojoba oil. No added ingredients or essential oils. Thank you for this post and your amazing point of view! This was very informative! Do you think I could use coconut oil instead of olive oil? Thank you very much for all info!! Most vegetable oils available for use in cosmetics, (or food), are suitable carriers and will dissolve the resins. Usually the scent of the infused oil is similar to but stronger than the fresh resin. Not at all like the burned resin. If your oil does not smell like the fresh resin then I would check your oil to see if it has gone bad or if any of your tools and vessels came in contact with a substance that could pass on it’s fragrance to your product. A good way to capture the scent of your fresh resin is to hold some if it tightly in your clenced hand, let it sit and warm for a few minutes, then put your nose to the warm resin and gently inhale. I am interested in your point of view on the following idea: dissolve boswellia tears in turpentine. I take turpentine (internally) periodically and recently got interested in boswellia. So I was wondering if steeping frank tears in clean turpentine for a certain number of days or weeks (to be determined) would extract the boswellic acid? As an experiment I have a tablespoon soaked in turp in a small bottle sitting for a few days and start seeing a thick cloud forming on top of the tears and was wondering if that’s the therapeutic part or something else. Yes, Frankincense oleoresin will dissolve in Turpentine and other essential oils in much the same way as it does in warm oil and alcohol. The water soluble gum will be left behind as granules that you can sediment or filter out. Heating thr mixture in a water bath will help dissolve the resin and speed up the process. I suggest a gentle heat between 40-60 degrees centigrade. It will benefit from macerating for a few weeks in a warmish spot. I would leave it to sit 4-6 weeks before filtering and bottling it. Make sure you powder the material as fine as you can. The thick cloud you saw floating in the turpentine is likely the resin dissolving in the turpentine.